No amendments have been made to the drawback provisions (Section 74 or Section 75) under Customs Act 1962 in the GST regime. Hence, the drawback scheme will continue in terms of both section 74 and section 75. Option of All Industry Rate (AIR) as well as Brand Rate under Section 75 shall also continue. Drawback under Section 74 will refund Customs duties as well as Integrated Tax and Compensation Cess paid on imported goods which are re-exported. At present Duty Drawback Scheme under Section 75 neutralises Customs duty, Central excise duty and Service Tax chargeable on any imported materials or excisable materials used or taxable services used as input services in the manufacture of export goods. Under GST regime, Drawback under Section 75 shall be limited to Customs duties on imported inputs and Central Excise duty on items specified in Fourth Schedule to Central Excise Act 1944 (specified petroleum products, tobacco etc.) used as inputs or fuel for captive power generation. A transition period of three months is also being provided from date of implementation of GST i.e. 1.7.2017. During this period, existing duty drawback scheme under Section 75 shall continue. 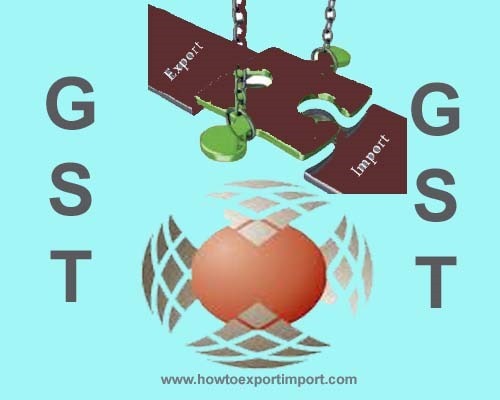 For exports during this period, exporters can claim higher rate of duty drawback (composite AIR) subject to conditions that no input tax credit of CGST/IGST is claimed, no refund of IGST paid on export goods is claimed and no CENVAT credit is carried forward. A declaration from exporter and certificate from jurisdictional GST officer in this regard has been prescribed in the notification related to AIRs. This will prevent double availement of neutralisation of input taxes. Similarly, the exporter can claim brand rate for Customs, Central Excise duties and Service Tax during this period. Exporters also have the option of claiming only the Customs portion of AIR and claim refund/ITC under GST laws. All Industry Rates for the transition period shall be notified before 1.7.2017. The AIR for post transition period shall be notified in due course of time. The certificates from jurisdictional GST officer as referred above may not be available during initial days. As per Systems design, whenever higher rate (composite rate) of drawback is claimed, the non-availment of credit certificate is a mandatory document and unless it is recorded as available, shipping bill will not move to LEO stage. In such a situation, all field formations shall ensure that exports are not delayed for requirement of the said certificate. The way out in such situation for the exporter is to amend the shipping bill to claim lower rate. The exporter will have an option to file supplementary claim as per Drawback Rules at a later date once the certificate is obtained. A similar issue in respect of Cenvat credit has been examined and clarified in the past vide Instruction no. 609/159/2016-DBK dated 13.03.2014.
paid inputs and inputs services. In such situation, an exporter opting to claim composite rate of duty drawback during transition period has to give specified declaration and produce certificates as stated above so that he does not claim double benefit. Exporter will have to reverse the ITC if any availed and also ensure that he does not claim refund of ITC/IGST. Requisite certificate from GST officer shall also be required to this effect. As mentioned earlier, exporters will also have option of claiming credit/refund of CGST/IGST and claim Customs rate drawback. sony : On 28 September 2017 Sir, Is this means whether we can claim SGST refund of the ITC even if we have opted for higher rate of AIR duty draw back? J VIJAYA KUMAR: On 07 November 2017 During the transition period of three months i.e. 1.7.2017 to 30.9.2017, composite rates of All Industry Rate (AIR) drawback are available to exporters, subject to certain conditions during transition period that ensure that input credit/refund under GST and drawback of composite rates are not taken together for the export product. 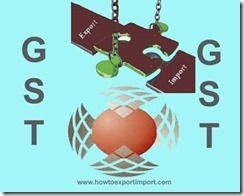 Exporter has to produce certificate from jurisdictional GST officer to avail composite rate. This requirement is applicable to supplies for export made on or after 1.7.2017, as all exporters are required to operate under GST from that date. An exporter of insecticides and pesticides is also clearing the goods domestically and availed input tax credit of Central GST and input tax credit of the IGST paid on the inputs and input services used in the manufacture of export product. The exporter has carried forward the amount of cenvat credit on the inputs and input services used in the manufacture of the export product. The exporter claimed drawback of duty @ 1.5%. The question is whether the exporter is barred from taking input credit when the exporter is claiming duty drawback. The exporter is of the opinion that they are entitled to both input credit and drawback as drawback is incentive for export. The exporter is of the opinion that the position remains the same even under the Customs and Central Excise Duties Drawback Rules, 2017 and All Industry Rates of Drawback related changes as clarified by the Board vide Circular No. 38/2017-Customs dated 22.9.2017. The composite rates of Drawback have been discontinued w.e.f. 1.10.2017. The exporter has never obtained certificate from the jurisdictional GST Officer that no Input Tax Credit of CGST/IGST is claimed. The exporter also claims rewards under Merchandise Exports from India Scheme. Is the exporter correct in his opinion? Another exporter of paper confirmed that they are also claiming duty drawback and input credit simultaneously and interprets that composite rate of drawback becomes applicable when two or more goods are exported together. Could somebody clarify? sajeer: On 21 June 2018 Dear Sir , We are coir exporters and we have 1% Drawback ,because we have not availed cenvat .Now our local refund office we cannot refund gst 01.07.2017-30.09.2017 due to high rate of drawback .please clarify . Chinnarao: On 15 August 2018 Dear Sir, We are SEZ Developer and import indigenous chemical consumables from local manufacturing unit. Am i eligible for duty drawback. if i am eligible, can i claim drawback for previous transactions also ( Last five years?). Please advise. siva krishna: On 01 January 2019 Dear sir, Can i get the notification no. / circular no. which says about additional duty drawback.